If you had read what we have been saying so far this expiry then everything the FTSE did last week was totally in keeping and as expected. The zone should be 6950-7050, and the only surprise is that this is not reflected in the above table, but, again, activity is pitiful. The unsurprising facts are that the FTSE has traded between 6950 and 7050 all week, especially 7050, which has been the limiting factor all week. Considering the DJX has added almost 1300-points last week makes this hurdle at 7050 all the more impressive, as in reply to the Street’s 5% gain London has actually lost 60-points. However, all is not lost, as on Friday the high was 7042.07 and the low was 6965.60, and although not exactly on the nose it is easily close enough considering the past five trading days to call this a zone bandwidth test, so a breakout is very likely. Having just said that, on Monday 26th November the intraday low was 6952.86 and the high 7050.96, so it’s not the first zone bandwidth test, which is also why we allow a degree of latitude, but also why a breakout is not a given. It should, and let’s face it 7050 has been sternly tested on every day last week and three times the week before, so it is way past our strike 3 rule. 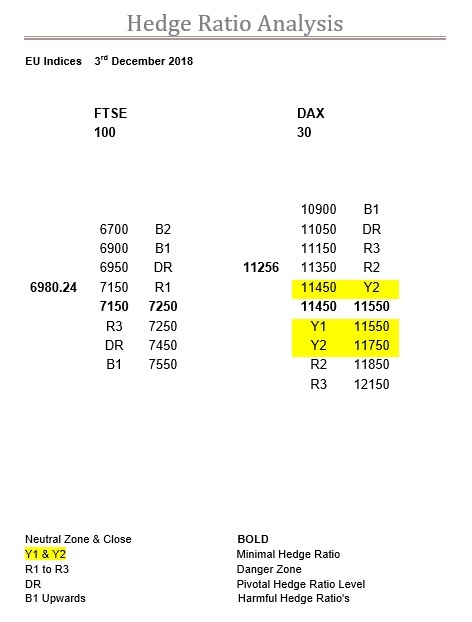 When we last looked at the DAX on the 26th November 11250 was R3 and we pointed out that that was far less a hurdle than 11050 was being DR.
And, right on cue, that very day it gapped up at the open by 123-points, but more importantly above 11250, to 11315. The following three days the intraday lows were 11264, 11279 and 11275. As you can see in the above table R3 has now receded to 11150, but really the most important aspect is the appearance of a lot of Y ratio. This, now makes 11350 as a very significant level. If it can get over this then it is into the minimal Y ratios, which stretch all the way up to 11850, so buckle up. SPX , NDX and DJX with so much Y ratio what did you expect? Today’s Ratio Table, levels and comment.